Losing weight can be difficult. If you are struggling with obesity and related health problems, and you have tried unsuccessfully to lose weight, bariatric surgery may be right for you. Our UCI Health weight-loss team offers you the most successful and least invasive weight-loss surgery options. After weight-loss surgery at UC Irvine Medical Center, our patients safely shed excess pounds and experience a dramatic improvement in weight-related health problems. Our highly skilled team — which has earned recognition from OptumHealth™ and the Blue Cross Blue Shield Association for delivering the highest quality and safest bariatric care — also specializes in managing complications from previous weight-loss surgery. When you come through our UCI Health doors, we work with you to develop a treatment plan tailored to your individual needs. Our UCI Health weight-loss surgeons specialize in the most advanced, minimally invasive weight-loss procedures in Orange County, including the Roux-en-Y gastric bypass, laparoscopic adjustable gastric banding and vertical sleeve gastrectomy. UCI Health has been chosen as a Boeing Center of Excellence because of our expertise and our ability to offer active and retired employees and their dependents the best in bariatric surgery. 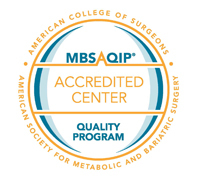 Our bariatric surgery program is accredited by the Metabolic and Bariatric Surgery Accreditation and Quality Improvement Program (MBSAQIP). This means we are held to the highest standards of quality available in bariatric surgery. Our weight-loss program, accredited by the American College of Surgeons (ACS), received recertification in June 2013 as a Level 1 bariatric surgery center. This designation demonstrates that our multidisciplinary team has the skill, experience and latest technology to deliver the highest level of personalized bariatric care. The rigorous ACS review process ensures that our patients experience safe, effective outcomes. We also are designated as a Blue Distinction® Center+ for Bariatric Surgery by the Blue Cross Blue Shield Association. These centers are selected for having dedicated teams that provide the complete range weight-loss surgical care services, including patient education, inpatient care, post-operative care and follow-up care and body-contouring services in a safe, successful and cost-effective manner. The study showed that laparoscopic patients had less post-operative pain, a lower risk of infection, spent fewer days in the hospital, recovered faster and made more rapid improvements in their overall health and quality of life. After significant weight loss, many patients may seek surgery to remove excess skin. Our team includes experts in body-contouring procedures, including abdominoplasty, thigh lift, upper body lift and breast reshaping. Our team members include highly skilled physicians who have repeatedly been named "Best Doctors in America" in surveys of their peers nationally. We provide full-service, personalized care throughout your journey to health and body transformation. Before surgery, every patient has three visits with the bariatric surgery team. This is done to ensure the surgery is appropriate, safe and successful. We closely follow our patients after surgery. Our follow-up care schedule includes visits at one week, one month and quarterly for the first year, then twice a year after that. At every visit, our patients are seen by the surgeon, a dietitian and a social worker. The UCI Health multidisciplinary bariatric surgery team includes nationally regarded gastrointestinal surgeons and an international authority on body contouring after massive weight loss, as well as experienced anesthesiologists, nurses, psychologists and patient coordinators. We also work closely with the UCI Health Weight Management Program, which offers physician-supervised weight control programs at UC Irvine Medical Center in Orange and Gottshalk Medical Plaza in Irvine. The program is run by a professional staff that includes registered dietitians and certified exercise specialists who specialize in treating and educating significantly overweight or obese patients. The weight management program emphasizes reducing risk factors for disease, behavioral change, nutrition and physical activity for long-term health management. For more information, call 714-456-8633 or 949-824-8770. If your BMI is 30 or higher, you may be a candidate for bariatric surgery. If your BMI is under 30, but are still struggling with your weight, our Weight Management Program can help you achieve your goals. If your BMI is 30 or higher, schedule a consultation with the Bariatric Surgery Services team. Call us at 888-717-4463 to get started.